Over the years, MySpace has brought forth a number of musical acts that otherwise would likely have never reached an audience at all. Some have been worthwhile and some… not so much. With his simple melodies and lightly strummed ukulele, Singer/songwriter Christofer Drew (aka Never Shout Never, aka NeverShoutNever, aka NeverShoutNever!) falls into the former category with both feet – and audiences are already realizing it. As I write this the band’s EP The Summer EP – released today – is sitting pretty at number eight on the Itunes top albums list. Not bad for a band that’s only been around for a few years and is fronted by an 18 year old from Joplin, Missouri. But, as Drew croons on “On The Bright Side:” “You’re only as small as the world makes you seem.” Today the world is letting Never Shout Never know that they’re not as small as they might have thought. Drew’s voice isn’t especially unique – check out the last decade of emo singers – but he projects a childlike innocence and wonder with the world that bleeds through in his high-pitched vocals and invites the listener to follow him on his musical journeys. Take the opening line of “Hummingbird” as an example: it may be hopelessly simple – “I like you” – but Drew draws it out to make it seem much more poetic than it really is. And this may be his true talent – creating wonder and beauty where others may not have. He works similar magic on the intentionally underproduced “Simple Enough” which sounds like it was recorded in a closet. The EP may be short – only six songs, but it’s a fine collection of music and if fans of the band continue to download their songs as energetically as they have today, the upcoming full-length album will be an easy success. 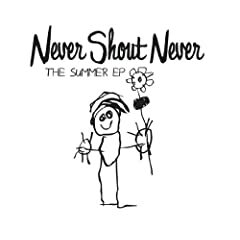 4 users commented in " Music Review: Never Shout Never, The Summer EP "
your review will go to hell with Mrs. B for kicking my sick puppy.